This documentation will guide you how to use the Themify Builder, a drag and drop layout tool with live edits and previews. The Themify Builder works with WordPress posts and pages, as well as custom post types. 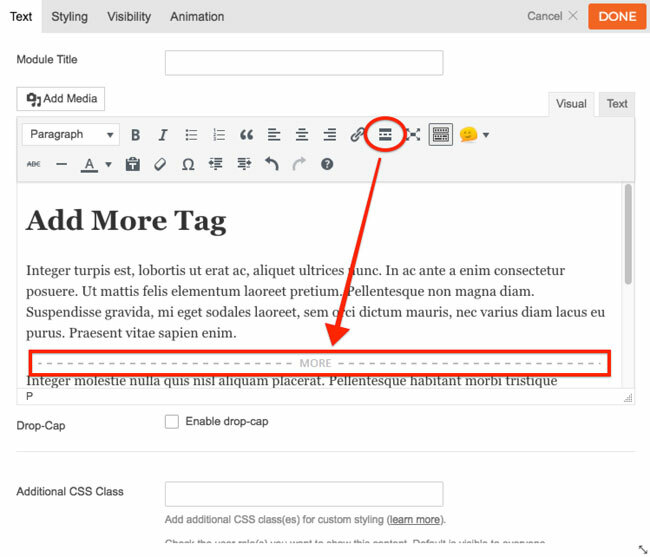 Shortcodes and HTML tags are supported with the Text module. The Builder can be used in both Backend Edit Mode and Frontend Edit Mode. NOTE: Themify Builder is included in the framework of all themes. If you are using a Themify theme, you don't need to install the standalone Builder plugin additionally. First add or edit a post/page. Below the content editor (make sure the post is saved/published), you will find the "Themify Custom Panel > Themify Builder" tab like the screenshot below. Click on the Green "+" icon found on the top left corner, or at the last row to open the module container. Click on the "" icon to lock the module panel as you edit on the backend. You can also drag and drop a rows and saved library content by toggling on the tabs. NOTE: The options below will appear when you select more than one column. Responsive Grid: You can also set the column arrangement on mobile or tablet. 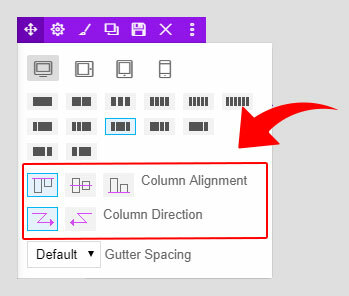 Column Alignment: Set modules on the entire to top, middle, or bottom alignment (Click here for more info). Column Direction: Module direction position from left to right, or right to left. Gutter Spacing: The vertical spacing between columns. Sub-Rows/Columns: To make sub-rows/columns, go to the module panel and click the "Rows" tab. There you'll see preset rows that you can drag and drop to any row/column. This will allow you to add a sub-row/columns. NOTE: Responsive styling works on backend, you'll see modules highlighted in blue when responsive styling is active. The frontend edit mode works similar to the backend mode except it provides live preview. The image below illustrates how the Builder frontend edit works. View any post or page on the frontend (NOTE: WordPress default homepage is actually a blog archive page, you would need to create a static front page to use the Builder on homepage). On the frontend, from the top admin bar (make sure your WP Admin Toolbar is enabled), select "Turn On Builder". You will see the Buidler toolbar overlap the top admin bar. Save = Click to save all changes done using the Builder. Revisions = This is the dropdown button beside the Save button. You can select to save or load a revision. Close = Click this to close the Builder. Edit in Backend = Click this to edit the Builder on the backend. Help = Click to open the Builder Tutorial video lightbox. Duplicate This Page = duplicate the page along with the Builder content. Load Layout = Apply pre-built Builder Layouts to the current page. Save as layout = Save current layout to use on another page. Import = Import Builder content from exiting posts or pages. Export = Export the Builder content (export will generate a ZIP file which be imported later using the import option). Undo/Redo = Undo/redo any Builder modifications before saving or closing the Builder. Responsive Styling = Customize styling on desktop(), Tablet Landscape(), Tablet Portrait(), or Mobile(). 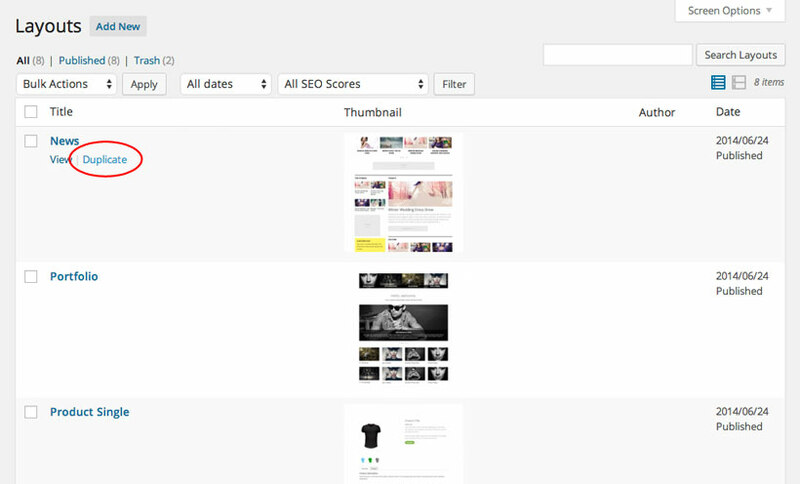 Preview = See how it looks when users view your site. Also, when you select mobile or tablet on responsive styling. Zoom Out = Scale to view in 75% or 50%. Module Panel = Hover over to showcase module panel. TIPS: if you don't see the top admin bar (WP Admin Toolbar) on the frontend, it is likely disabled. To enable top admin bar, edit your user Profile and check the "Show Toolbar when viewing site" option. NOTE: if you don't see the Builder grid after turning on the Builder (but the module panel presents), it is likely because the template does not have the required WordPress function, the_content() or the template is using the_excerpt(). In this case, try to add a new post or page. Drag module from the Module Panel to the Builder column. More = Hover to view more row options. Drag row top bar up/down to re-position the row. Sub-Rows/Columns: To make sub-rows/columns, go to the module panel and click the "Rows" tab. There you'll see preset rows that you can drag and drop to any row/column. This will allow you to add a sub-row/column. Edit = edit module options (TIPS: double-clicking on the module overlay area will bring up module options as well). The default WordPress homepage is actually a blog archive page which shows all your latest posts. Please note that the Builder does not work on archive pages. To use the Builder on the homepage, first you must create a static page (e.g. "Home") and then go to WP Settings > Reading and set that "Home" static page as the front page. First add a new page (e.g. Home). Publish the page and create the Builder layout as you like. When you are done, go to WP Settings > Reading, on "Front page displays" option, select the "A static page" radio button and then select the "Home" page that you've created. Leave the "Posts page" option empty (if you need to create a "Blog" page, please refer to this tutorial). You can also set the column alignment or the order of your columns on any row with the column alignment and direction feature. This option can be found when you hover your cursor on the top left corner of your column panel. For column alignment, you can choose to set it to top, middle, or bottom. What this does is that it moves your module to have the same alignment across the row or sub row.For the column direction, you can also set the column direction whether to showcase your column from left-to-right or right-left. NOTE: The column alignment and direction feature will not appear on your row if you've only set it to showcase one column. This feature will only appear if you've set it to show more than one column in your row. Both of these can also be customize during responsive styling. Responsive columns feature allows you to set the number of columns that appears on desktop, tablet, and mobile. 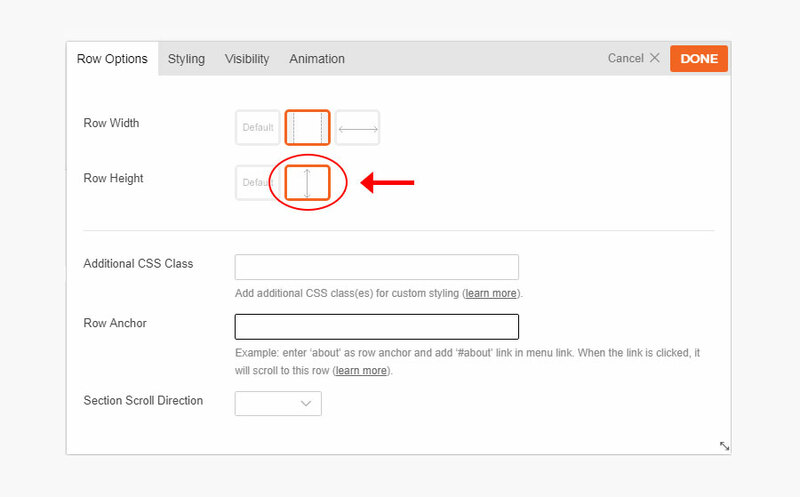 Double-clicking on a row, column, or a dropped module will bring up the option lightbox. Press Command+S (PC: Ctrl+S) will save the module (make sure your cursor is on any input field, textarea, and select dropdown). Press Escape key will cancel/close the module lightbox. On frontend edit mode: press Command+Z (PC: Ctrl+Z) to undo or Command+Shift+Z (PC: Ctrl+Shift+Z) to redo. On frontend edit mode: press Command+S (PC: Ctrl+S) will save the Builder. 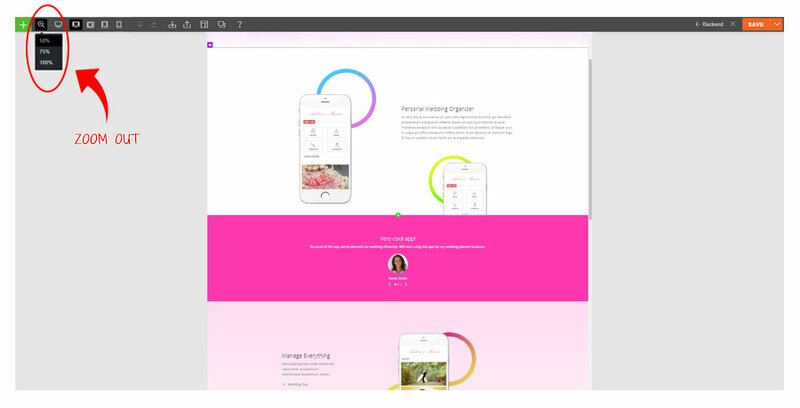 Builder Layouts are the pre-designed layouts which you can apply to any page for quicker prototyping. You can use the pre-built layouts packed with the Builder or create your own custom layouts. 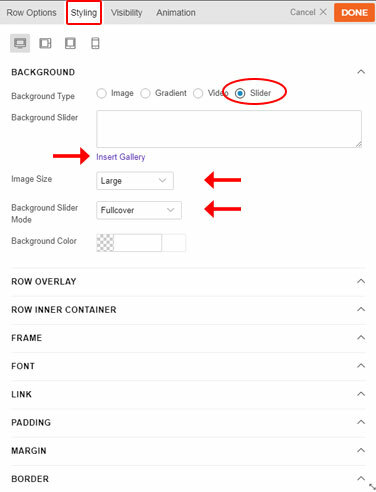 Then click on the Layout thumbnail to apply (warning: your existing Builder content on the page will override with the Layout). The page will be refreshed and the selected Layout will be loaded to the page. NOTE: the Builder Layouts is only available in single post or page, not available in blog archive pages such as categories, archives, search, tags pages, etc. Create a new custom Layout from scratch. Duplicate from an existing post/page created with the Builder. Save from an existing post/page created with the Builder. Navigate to WordPress Admin > Themify/Builder menu > Builder Layouts. Click on "Add New" button. Enter the title, upload the Layout Thumbnail (option) and click "Publish". 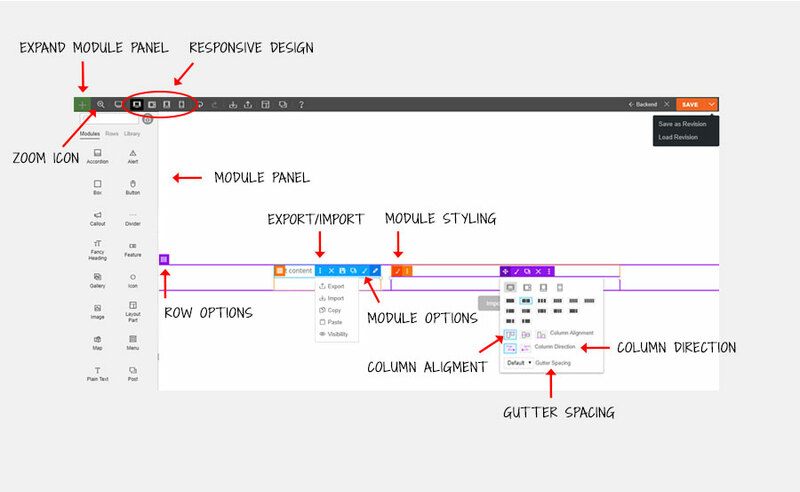 Use the Builder edit panel to create the Layout as desired and click "Save" when you are done. 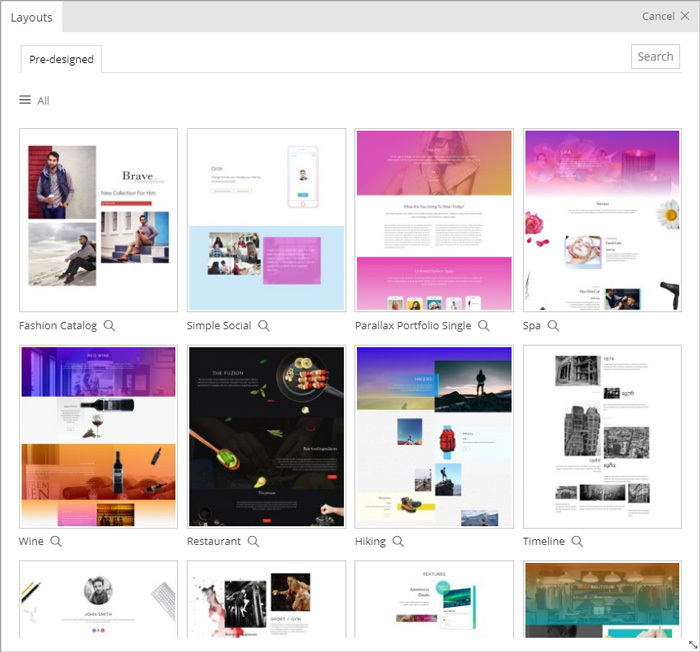 The new Layouts will be available in the Layouts library lightbox. Hover the Layout item on the list and click "Duplicate". You will see the duplicated post after. You may edit the duplicated Layout as desired. Go to the page frontend (the page that you want to save as a Layout). 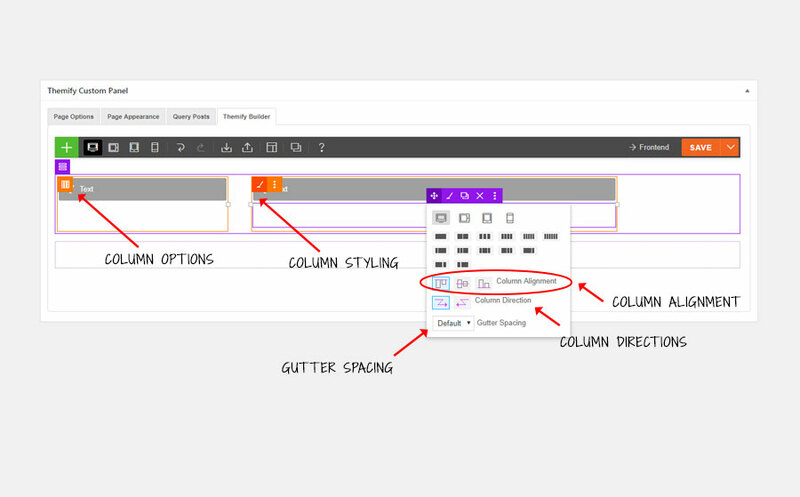 From the top admin bar > Turn on Themify Builder > Select the Layouts Icon > Save as Layout. Then upload the Layout Thumbnail and title, and click "Save" after. 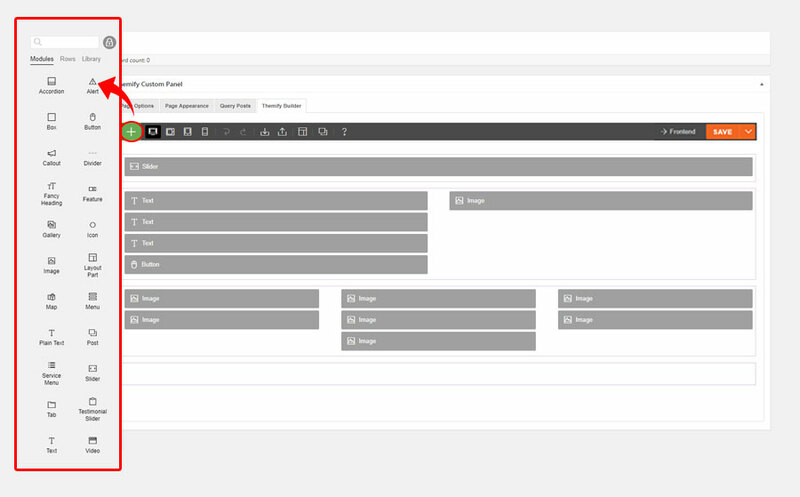 The Layout Parts are re-usable layout parts that can be included into Builder content or anywhere in the post content and widget using its shortcode. 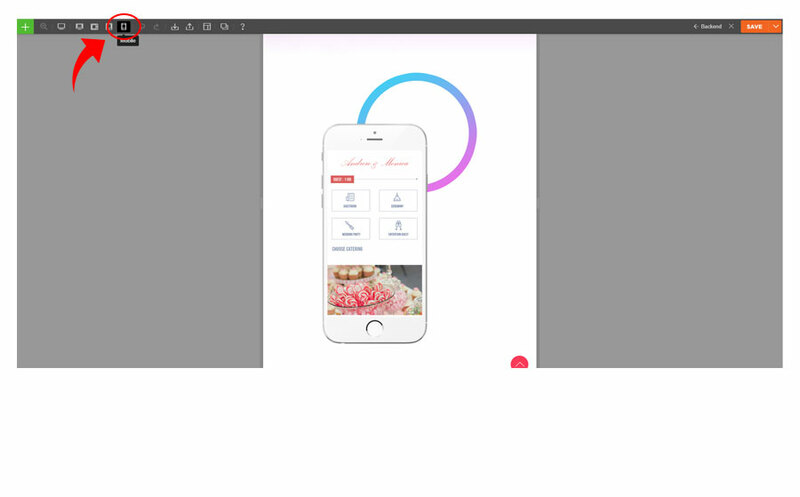 Layout Parts can be edited live on the spot without directing yourself to another page or opening a lightbox. When the Layout Part is updated, any post or page using that Layout Part will be also updated simultaneously. Layout Part is extremely useful for showing the same content in multiple areas/pages (e.g. client logos, contact info/map, banner ads, service list, etc.). Method 1) Save as Row/Module as a Layout Part You can save any row or module as a layout part by clicking on the save () icon and check the "Layout Part" checkbox. This will automatically save it as a Layout Part. 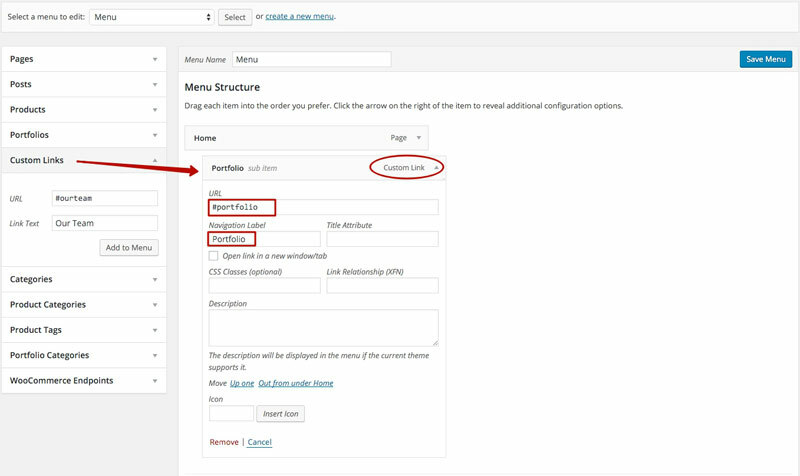 Navigate to WordPress Admin > Themify/Builder menu > Layouts Parts. Enter the title and click "Publish". The new Layout Part will be available to select in the option lightbox of the "Layout Part" module. Using the "Layout Part" module. 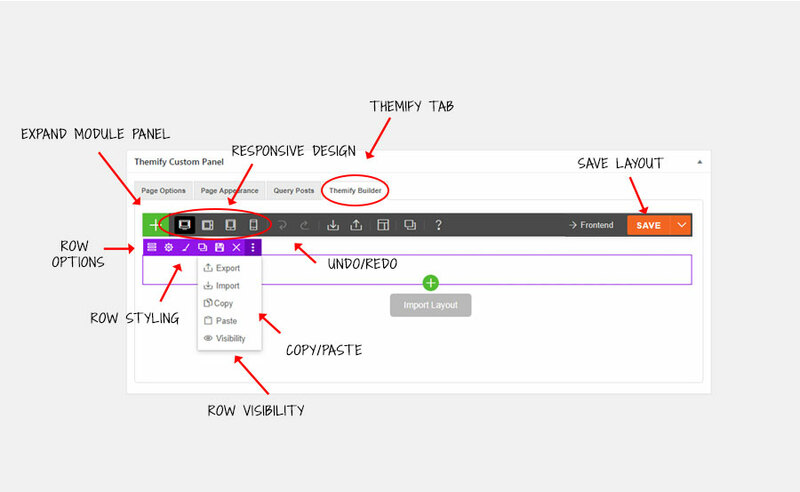 Method 2) Using the [themify_layout_part] shortcode You can also display Layout Parts using the following shortcodes in the post content, Text widget, and inject it in the page using the Hook Content. The Layout Part can be queried by its slug name or post ID. [themify_layout_part slug="client-logos"] = this means show the layout part with slug name 'client-logos'. [themify_layout_part id="12"] = this means show the layout part ID# 12 (here is how to the post ID number). The Builder Import/Export tool can be used to share Builder page layouts with clients or use it as a backup to create different versions of your layouts (i.e. export the Builder content for backup purposes which can roll back in the future). To Export: from the frontend top admin bar, select Themify Builder > Import / Export > Export (it will prompt you to download a zip). To Import: from the frontend top admin bar, select Themify Builder > Import / Export > Import (upload the exported zip). 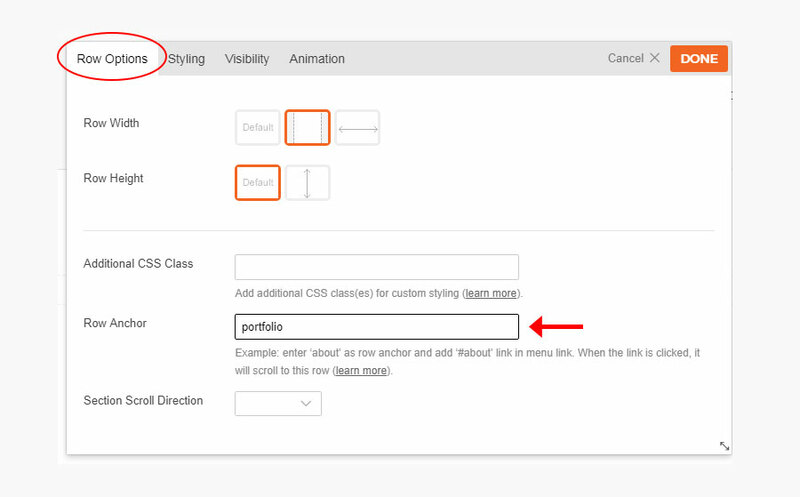 Result: When the #portfolio link is clicked, or when users go the URL with the #portfolio anchor (e.g. http://yoursite.com#portfolio), it will scroll to the row where it specified Row Anchor = "portfolio"
Fullwidth layout is only available in Themify themes. If you are using the Builder with on a third party theme, the layout width is inherit from the theme styling. However, you may use the .has-builder body class to write Custom CSS to make the theme layout containers fullwidth (read FAQ #3 below for the sample code). Our support team can help you with this custom CSS if you are not sure, please post on our support forums. Then the Builder row background will expand fullwidth, but the row content will remain within the page width container. 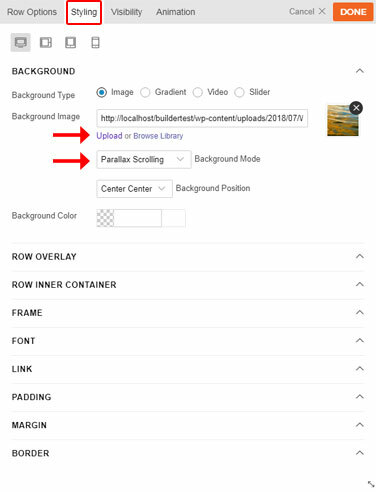 To make the row content fullwidth as well, in Row > Options, select Row Width = Fullwidth. Full height row will set the height of the row in 100% viewport height and the row content will automatically align in the middle vertically. Select Row Height = "Fullheight (100% viewport height)"
Full Width Row Container = This sets the container to full width and leaves the content as default. Full Width Content = This sets the both the container and content to ful lwidth. Select Row Width= "Fullwidth row container" or "Fullwidth content"
NOTE: For Safari browsers, video URLs from WP multisite path doesn't play. To avoid this, insert the direct video URL. NOTE: Inserting a YouTube/Vimeo link won't allow users to toggle the video (i.e. play, pause, or mute). It will just auto play the video when users visit your site. Background Image: This is a fallback background image. You'll need to insert an image because video background does not work on mobile. 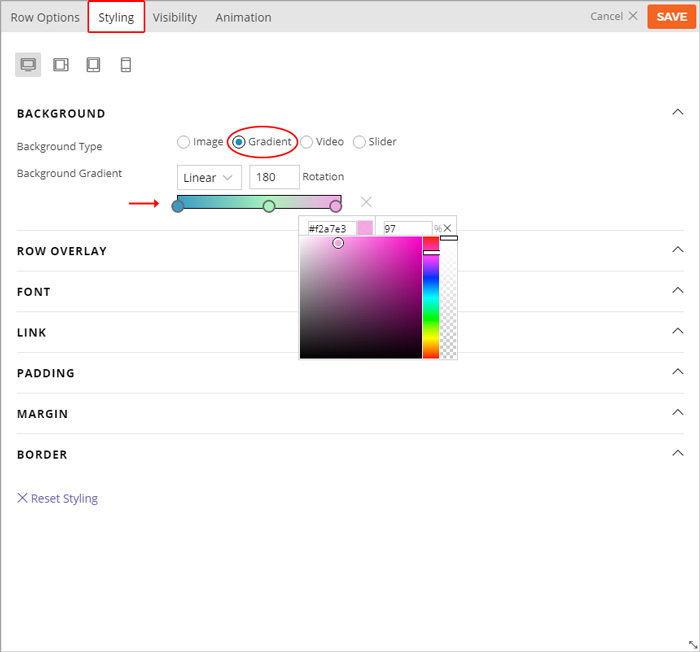 With Builder turned on, select Row > Options > Styling Tab, upload a "Background Image" and select "Parallax Scrolling" in the "Background Mode"
(Optional) Select a "Background Position" for the image. Best Fit = slider images will be fit within the row. Fullcover = slider images will scale to fully cover the row. Ken Burns = the background images will pan, zoom, and fade slowly providing an astonish visual effect. NOTE: Gradient background is only available on both row and columns. They cannot be applied to module backgrounds. Background Gradient: Here you can select to showcase the gradient effect as linear or radial, and also adjust the rotation on how you would like the color gradient to appear. Color gradient Bar: The color selector bar gives a preview of how your color gradient will look on your row or column. 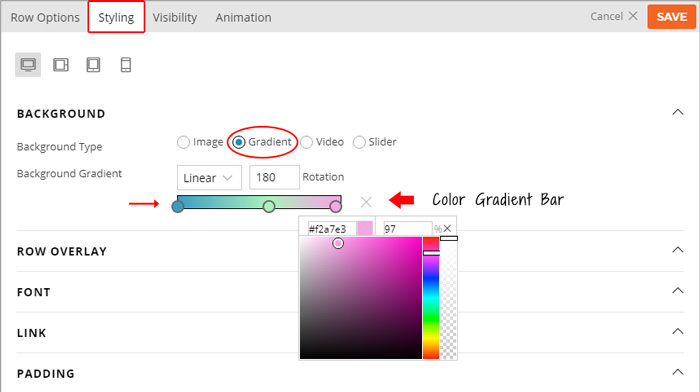 Click on the color bar to add a new color to the gradient color scheme. Drag the color circles to adjust how the color is shown. The color picker can also adjust the opacity of the color that you select (NOTE: You can input an unlimited number of colors). Overlay Color and Hover Color: Similar to the above options you can also add a gradient overlay color. Overlay Color The base color that users see on top of your background image. 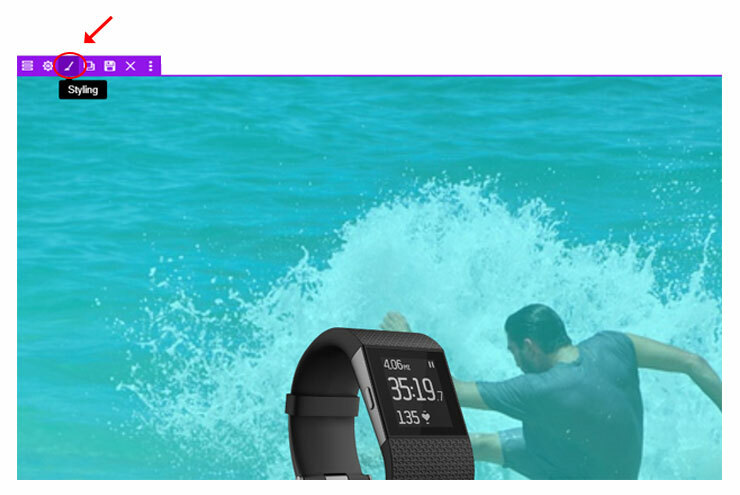 Overlay Hover Color - The color that appears when user cursor hovers over the row. Color Picker - This allows you to choose any color you would like to appear on the row. Opacity - This gives you to the ability to choose the level of transparency of the color you choose. 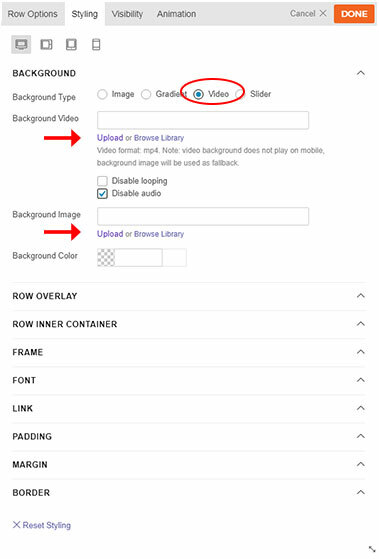 Background Image = This option is used to set the URL of the background, you can either upload or add background using the media library. Background Color = This option is used you to add a flat color to the background of the inner row. Padding = Padding refers to the inner space of the container. Border = This option is used add border around the element. Background = As the name suggests, this feature allows you to add backgrounds to the element. Repeat All = The background image will be tiled (repeat all). Repeat Horizontally = The background image will repeat horizontally. Repeat Vertically = The background image will repeat vertically. Do not repeat = This background image is as it is (without repeating). Fullcover = The background image will fill and fit in the container completely. Parallax Scrolling = Image will have the parallax effect as you scroll. Zoom Scrolling = Image zooms as your scrolls. Zooming = Image auto zooms. Background Position = Set the position of how the background image appears. Background color= This option is used you to add a flat color to the background of the row. Font= This option is used to change the font styling. Link= This option is used to add text decoration and to change the color of the links in the row. Margin = Margin refers to the outer space of the container. NOTE: The styling options available for the individual Modules works similarly to the Row styling options. Style all row/column edges (from top, bottom, left, and right) with the row frame styling. You can choose from 25 beautiful preset shapes or upload your own shapes (eg. you can upload your SVG or PNG file as the frame style). There are options to set frame width, height, color, and repeat. It can also be styled differently for desktop, tablet, and mobile. Type = Choose from the 25 presets or add your own custom frame (support SVG or PNG files). Color = Set the color and opacity of the frame (Does not apply if you set custom frame). Width = Width of the frame in px, percentage (%), or em. Height = Height of the frame in px, percentage (%), or em. Display below content or Display above content = Choose whether you'd like the frame to appear below or above the content on your page. Animation is the transition effect that triggers when the elements present in the viewing area. It can be set to rows and modules individually. There are over 60+ animation effects. 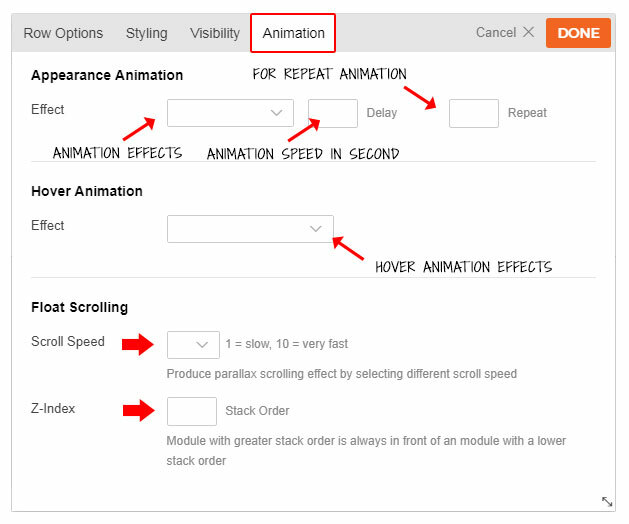 Effect: Select from the dropdown the animation that you'd like to be used on the entire row or module. You can also set the animation speed in seconds, and the number of times you would like the animation to repeat. The element will animate as soon as it hits the viewing area. Effect: animation that'll appear when you hover over the element. Scroll Speed: Produce parallax scrolling effect by selecting different scroll speed. 1 = slow and 10 = very fast. NOTE: The faster you set the speed the higher the module will scroll up. Z-index: Module with greater stack order is always in front of an module with a lower stack order. This option allows you create an overlapping effect with all your modules. You can set the rows and modules whether to be visible on specific device viewing (desktop, tablet, and mobile). By default, all device viewing are visible. 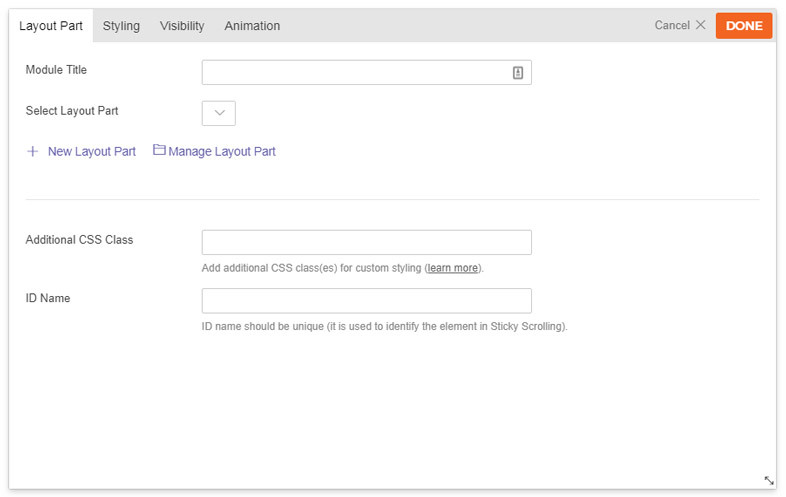 This new feature allows you to break your Builder layout into multiple pages. Making your pages load faster while still allowing your readers to read all of your content. Open the Module panel > Click the Row tab > Underneath the preset rows, you'll see the "Page Breaks" module. 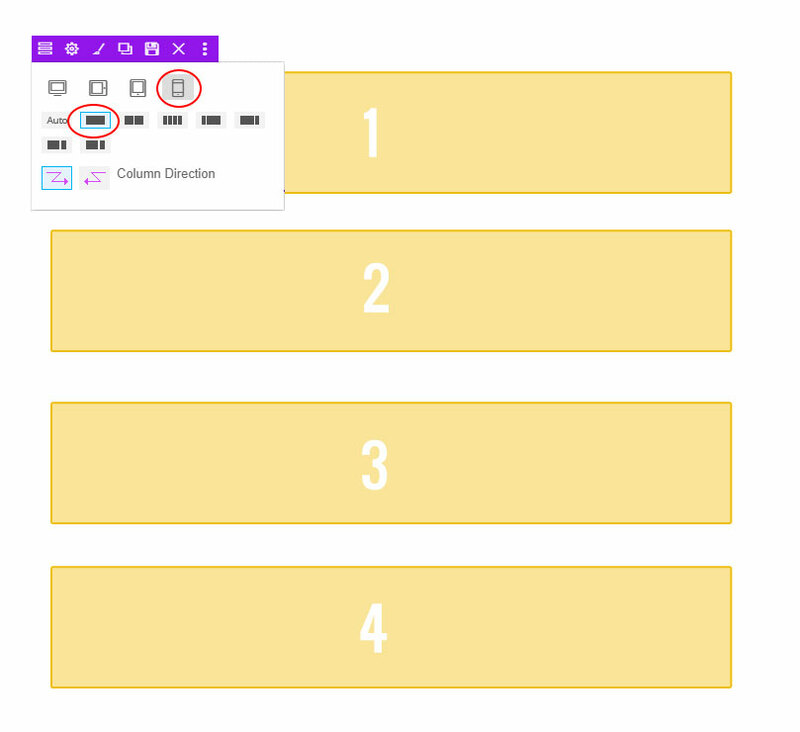 Drag and drop it between any row to add a page break. You can also add multiple page breaks on a page. Doing so, will show a number beside the page break module that'll showcase how many are added. Hover over the page break and on the right corner you'll see "X". Click it to delete the page break. Builder Revisions gives you a "save as" like feature, allowing you to save your Builder layout with unlimited versions. The Builder will log this revision and allow you to revert it back, if you'd like. This is great for users who suddenly make a mistake when changing something from their site and don't know how to fix it. To save Revisions: on the frontend Builder, next to the Save button, hover the arrow and select "Save as Revision"
To load Revisions: select "Load Revision" and it will prompt you whether to save the current state before loading a revision. NOTE: If the revision list on the option lightbox shows gray color and the revision link is not clickable, it means the revision does not have Builder layout, thus it won't allow you to load empty Builder revision. You can insert a read more button to trim down the text and focus on the visuals in the text module. Readers who want to read the full content can click the "read more" button. This features allows you to style how your site looks on a tablet, mobile, or desktop. To access this feature, first turn on the Builder > on the Builder toolbar select to view your site in desktop(), Tablet Landscape(), Tablet Portrait(), or Mobile(). When these icons are selected you'll see a live preview where you can customize the styling and the module data. Notes: When you edit the styling in both tablet or mobile view, you can add or edit the Builder content. But when you do this note that it will apply on desktop version as well. Only the styling is applied specific to the device you're viewing (ie. mobile styling only applies on mobile). You can also preview how it'll look on mobile and on tablet by clicking on the preview button. Click the Zoom Out icon () to view a preview of your site in either 75% or 50%. Accordion = Displays expandable/collapsible content. Alert = Schedule, display for a specific number of times, show to either login/public visitors, or auto close after a certain number of seconds your content. Box = Displays text content in a box. Callout = Displays a "call for action" box (heading with a link button). Divider = Displays a divider between modules. Feature = Displays an animated circle with a large icon. Gallery = Displays a gallery with image lightbox/zoom. Image = Displays an image with title and caption. Map = Displays a Google Map. Menu = Displays WordPress custom menus created in Appearance > Menus. Post = Displays posts from any category. Slider = Displays a slider of posts, images, videos, or text content. Tab = Displays tabbed content. Text = Visual text editor with shortcodes and HTML support. Video = Embeds videos from YouTube, Vimeo, etc. Widget = Displays any WordPress widget. Widgetized = Displays a widget area. 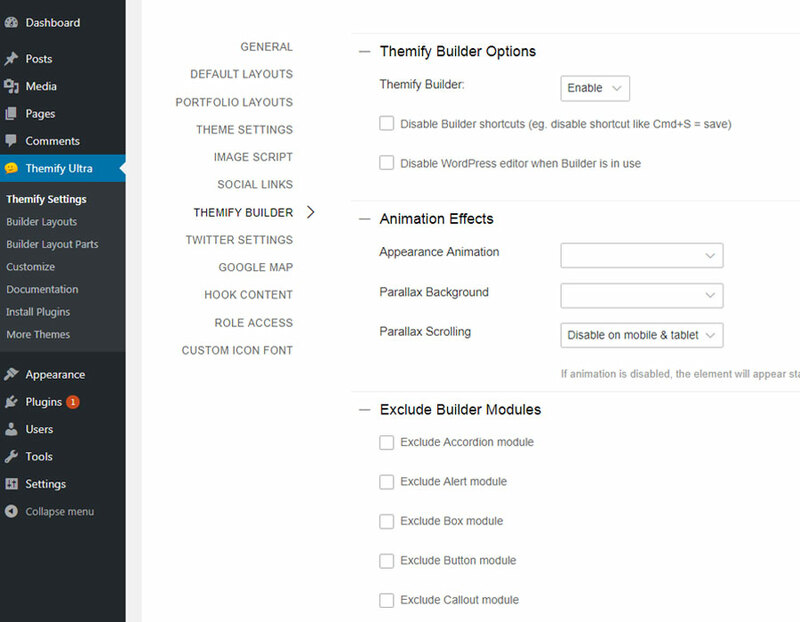 If you are using a Themify theme, the Builder settings can be found in the Themify panel > Settings > Themify Builder. Exclude the modules individually (NOTE: when a module is excluded, only the excluded module will not appear on the page). 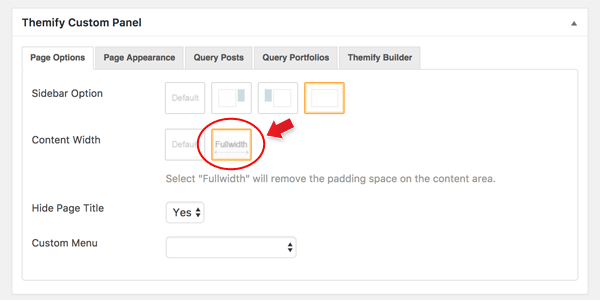 If you are using the Themify Builder plugin, the Builder settings can be found on the WordPress admin sidebar > Themify Builder > Settings. NOTE: If you don't see the Builder Script Minification option in the Theme Settings option, it means caching is not supported with your server (either due to old PHP version or server not permitting to write cache files). Enable to minify scripts for faster Builder performance. Enable Builder Cache = This will cache the Builder. You can clear this anytime or set the time in which the cache will expire. Builder Content Placeholder: In the previous version, the Builder content is always appended after the content in the WordPress editor. Now you will see a badge in the editor called "Builder Content Placeholder", which represents where exactly the Builder content will be displayed. You can add content before or after the content placeholder. If you don't see the Builder Content Placeholder, make sure you are using the latest version and try to re-save the post/page again. The Builder static content is served as your fallback content when the Builder is disabled/removed. It also allows WordPress search your content in the Builder. When you update the post/page, the Builder static content will refresh/regenerate (that is normal). It will not appear on the frontend when the Builder is active. 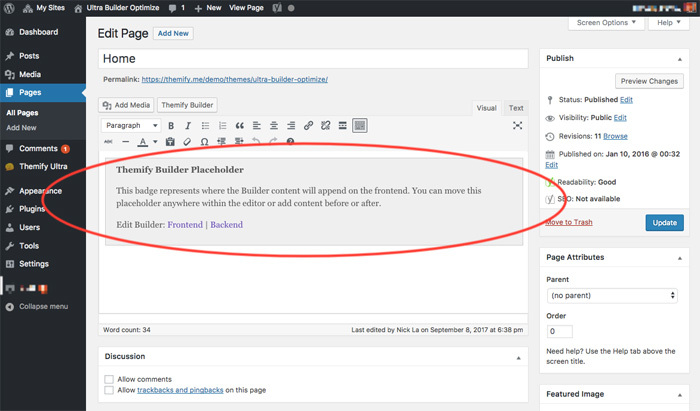 The Builder Content Placeholder badge only applies to WordPress prior version 5.0. If you are using WP 5.0+, the Builder content is treated as a Gutenberg Block. Custom CSS class is used by developers to write custom CSS to apply styling to specific elements that contains the CSS class name. The advantage of using custom class is when you update the CSS styling, it will apply to all elements that contain the target class name. You only need to write the custom CSS once, then it can be reused to as many elements as you want by adding the custom class name. 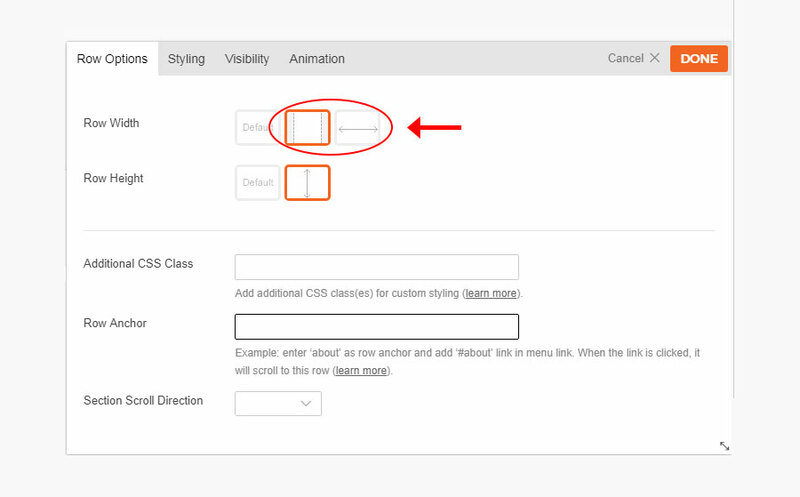 Lets say you have a few rows or modules that you want to have the same yellow background and black text color, you would add 'yellow-box' in the "Additional CSS Class" field (all rows and modules have this field in the option lightbox). Then add the sample custom CSS as below. Now whichever rows or modules have that additional CSS class will have yellow background with black text styling. When you change the CSS code, it will apply to elements automatically without having to edit the Builder. The Builder is extendable with Addons. Installing Builder Addons is the same as installing standard WordPress plugins. Here is a detail tutorial on how to install addons. Does the Builder work on the homepage? The Builder works with all posts, pages, and any post type that has the_content enabled. The default WordPress homepage is actually an archive page that shows the latest posts. To use the Builder on the homepage, first create a new Page and then assign that page as the Front Page in WP > Settings > Reading. The Builder won't turn on the frontend. Why? - First, make sure that you are viewing a single post or page, not an archive page (examples of archive page: search, tag, category, taxonomy archive, etc.). - Second, make sure the top admin toolbar is enabled in your WordPress site. - Lastly, it is likely due to plugin conflicts. Try to disable all plugins and check again. I'm using the Builder plugin version and fullwidth row doesn't work with my theme. If you are using a third party theme and the fullwidth row option doesn't work with your theme, it is most likely due to the layout container width specified in your theme stylesheet. You can reset the container width to fullwidth with custom CSS. Let's say your theme has a container wrapper with 1224px width, you can reset it with the custom CSS below. The CSS below will only adjust the container if Builder content exists and it won't affect your theme and responsive design. UPDATE: The latest Builder plugin will display fullwidth row on all third themes as long the row has fullwidth content selected. Can I use the Builder to edit the header, sidebar, and footer? No, the Builder is for building layouts for content. It does not have the capability to edit the header, sidebar, and footer area. However, you can use the Builder to create Template Parts and then display the Template Parts in the header, sidebar, and footer using the shortcode provided (e.g. drop in a Text widget on sidebar and then insert the Template Parts shortcode). If you are using a Themify theme, you may use the Hook Content to insert shortcodes anywhere as you like without having to edit any template file or drop in widgets. Alternatively, you can use Themify Flow (our drag and drop theme Builder) along with the Builder plugin to achieve this. I don't use the Builder. Can I disable it? Method 1) Yyou can disable the Builder in Themify > Settings > Themify Builder. If you are using the standalone Builder Plugin, deactivate the plugin will disable the Builder. Once I disable the Builder, will the layouts created with the Builder show? No, the Builder is required to render the layouts that are created with the Builder. Where are the old custom post types (Slide, Highlight, Portfolio, and Testimonial)? Note: The updated Themify framework 2.1.2 and Builder plugin 1.3.1. has deprecated the following custom post types: Slide, Highlight, Portfolio, and Testimonial. To provide backward compatibility, the Highlight posts will remain functional if your site has existing Highlight posts. If you would like to continue using these custom post types, we've created a free plugin called Builder Deprecated CPT. This plugin will unlock the deprecated custom post types. When I try to import/upload Builder layouts zip or txt file, it says "Sorry, this file type is not permitted for security reason"? This is because the file format is not allowed in your WordPress network setting. To allow more file extension, please go to your WP Network Admin > Settings > "Upload File Type" > Add file format extensions (i.e. txt zip). My WP Admin is HTTPS, when I switch to frontend that is HTTP, the Builder doesn't work. When you login in admin that is secured (HTTPS), the login session is captured as HTTPS domain. If your frontend URL is not HTTPS, the frontend Builder will not work because the browser treats HTTPS as a different domain. To fix this: go to WP Admin > Settings, change the "WordPress Address" and "Site Address" to HTTPS URL. How do I trigger an active tab by using URL hash? First drop in a Tab module and create the tabs as you like. View the page on the frontend with Google Chrome, right-click on the tab navigation (https://cl.ly/2g2n183x2n3c) and select "Copy Link Address", now you can paste that URL as hyperlink (eg. the link URL would be something like http://yoursite.com/page-url/#tab-tab-6925-0-0-0-6925-2). I'm using a Themify theme and Builder, there is padding between the header and content area. How to remove it? That is the content container padding. To remove it, edit the page in the backend, on Themify Custom Panel, select "Content Width = Fullwidth". Using ScrollTo anchor feature in Builder, by default it scrolls to the top of the row. If your third party theme uses a fixed header, the header might overlap the row. To prevent this, you can offset the scrollTo position by adding the following function in child theme's functions.php file. In the code below, make sure you find the header CSS ID or class from your theme and change the #header selector in the code.